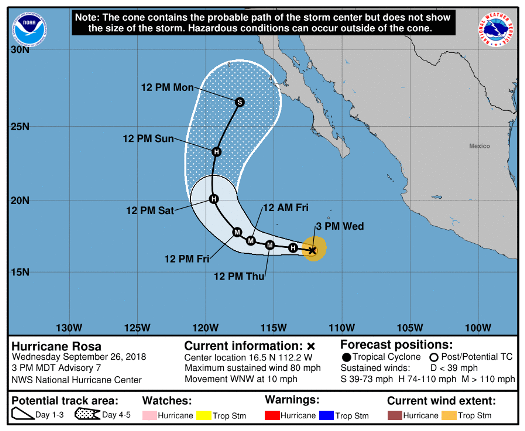 Hurricane Rosa has become the 10th hurricane of the eastern Pacific season and is expected to continue strengthening. At 11 a.m., the center of Hurricane Rosa was located 510 miles west-southwest of Manzanillo, Mexico. Rosa is moving toward the west-northwest near 10 mph, and this general motion is forecast to continue for the next two days. A turn to the northwest is expected by Saturday morning. Maximum sustained winds have quickly increased to near 75 mph, with higher gusts, and rapid strengthening is forecast to continue through tonight. Afterward, strengthening should continue at a slower rate through Friday. center, and tropical-storm-force winds extend outward up to 80 miles.